Client was a victim of fraudulent filings by his wife. Unknown to the client, wife filed fraudulent returns for 2005, 2006 and 2007 claiming an OID (Original Issue Discount) which resulted in significant refunds. Due to wife’s filing these fraudulent returns, the IRS assessed both husband and wife separately with approximately $29,000 in penalties. 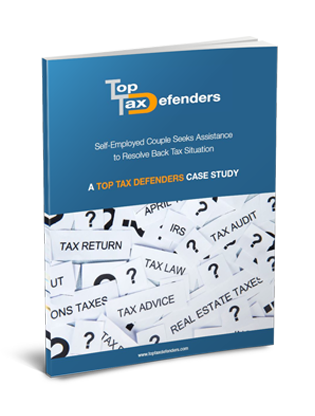 RESULT: Top Tax Defenders was able to get the penalties against the husband removed and able to unfreeze refunds due to husband. At the time when taxpayer engaged Top Tax he owed $23,591 due to substitute returns filed for him by the IRS and a recurring wage levy. RESULT: Within one week we completed 10 years of returns which resulted in the client only owing approximately $3000. Also within one week, we successfully released taxpayer’s wage levy. Taxpayer owed the IRS $13,038 when he joined with Top Tax Defenders. Due to taxpayer’s medical issues. RESULT: Top Tax was able to obtain currently uncollectable status. In 2013, the IRS discontinued the taxpayer’s uncollectable status due to the taxpayer selling a property in which his equity was $100,000. Top Tax at this point was able to remove all accruing penalties on his account for the amount of $2840.68 and set taxpayer up on a full pay with the IRS. Taxpayer came to Top Tax Defenders owing the IRS $206,258 for five years. Top Tax completed a financial analysis and submitted an offer in compromise for $15,850. RESULT: The IRS accepted the offer in compromise resulting in saving the taxpayer $190,408. Mark G. came to us with a balance of $36,901. Initially, he did not qualify for an offer in compromise (settlement). But after further discussion, Top Tax and Mark formulated a plan where he would qualify in a couple of months. RESULT: Top Tax submitted an offer for $600 and after a few weeks of negotiations was able to get the offer accepted, resulting in saving Mark $36,301. Client came to us with 5 years of unfiled tax returns. They owed over $125k and were currently being regularly contacted by an IRS revenue officer. Top Tax filed all of the missing returns for the client and handled communication with the IRS. RESULT: After all tax returns were filed and processed, the cilent owed only $4,400 of the total $125k. At Top Tax Defenders, we are fully committed to operational transparency. We make every effort to provide accurate, timely reports of our achievements as well as our shortcomings. Since we value the business of each and every one of our clients, we believe that this is simply the "right thing to do." Accurate, unbiased reporting on our tax relief success rate also serves as a valuable educational tool that current and prospective clients can use to calibrate their expectations for our tax services. Feel free to compare the statistics that we provide below to those of our competitors. Again, it is important to keep in mind that many tax relief firms do not provide such detailed success-rate reporting due to inconsistent performance. Top Tax Defenders has a rigorous case review process that identifies taxpayers who have relatively high chances of securing concessions from federal tax authorities. The IRS is a large, complex organization that maintains strict and often confusing standards for tax relief eligibility. While it might seem unfair for us to exclude certain taxpayers from our services, we only do so when we know that our services will be of limited utility. In other words, Top Tax Defenders has no interest in adding to the financial woes of individual taxpayers by charging them for services that they do not need. However, we do make every effort to connect overburdened taxpayers with useful information about a range of tax relief options. If we judge that our services are unsuitable for a particular prospect, we provide expert guidance about alternatives that may prove to be more helpful. Below, we outline selected tax settlement results that Top Tax Defenders has achieved. Keep in mind that these results are specific to successful cases in which clients qualified for tax relief help under applicable state and IRS guidelines. Additionally, our most successful clients scrupulously follow our guidance and advice throughout the tax relief process. While we make every effort to keep a fair and accurate accounting of our tax relief success rate, we must caution that every case is different. Your individual results may vary from the resolved-case statistics that we have tabulated below. Although we provide favorable results for the vast majority of our clients, we cannot absolutely guarantee that your case will produce a satisfactory outcome. Before soliciting our services, please take a moment to read and understand all of the tax relief information that we provide on our website. *Amounts are based on previous results; individual results will vary depending upon your ability to provide Top Tax Defenders with timely and accurate information. Fees are not included in resolution/settlement outcomes. We cannot guarantee that your tax liability will be lowered by a specific amount or percentage, or that your tax liability will be paid off within a specified time period. Top Tax Defenders will offer possible solutions to a prospective client after all relevant information is obtained during the initial consultation. While solutions will be offered to client, there is no guarantee of results implied or otherwise. "I would like to thank Kimberly for all of her assistance. She was very helpful and professional in answering all of my questions. Thanks Top Tax!"